A surfer, one of about 50 people who blocked Kauai's Nawiliwili Harbor yesterday afternoon, climbed atop a buoy to angrily shake his surfboard at the Hawaii Superferry. Hawaii Superferry's vessel Alakai found itself yesterday dead in the water on Kauai and Maui. Following on Sunday's actions, protesters blocked the ferry at Kauai last night for more than three hours, delaying its 6 p.m. scheduled docking at Nawiliwili Harbor. About 50 people on surfboards and in small boats stopped the vessel, and at about 9 p.m. about 20 people remained in the water. Coast Guard officials were arresting protesters as they came to shore. At least half a dozen were arrested. Last night's protest prevented the Superferry from docking at Kauai, and the vessel was forced to return to Oahu. It was due back about midnight. On Maui yesterday, Circuit Judge Joseph Cardoza issued a temporary restraining order halting Superferry operations at Kahului Harbor. The order also required the company to assist passengers they brought to Maui back to Oahu. Cardoza has scheduled a court hearing for 1:30 p.m. tomorrow to determine whether a preliminary injunction should be issued ordering Superferry officials to cease operation until they have completed an environmental assessment for Kahului Harbor. Hawaii Superferry President and Chief Executive Officer John Garibaldi said he was optimistic about the outcome of the hearing tomorrow. "We expect to resume operations on the 30th," he said. "Should that not happen, we'll be contacting those people to reaccommodate them." Maui Tomorrow spokesman Ron Sturtz said he was pleased with Cardoza's action. The Hawaii Superferry will not run between Oahu and Maui today and tomorrow. Service between Oahu and Kauai will continue as scheduled. » Customers who have booked voyages for today and tomorrow will automatically be issued refunds. » For customers who have already commenced travel and are due to complete travel today or tomorrow, the company will be in contact to rebook their return by air (pets included). Vehicles will be accommodated by the Superferry after tomorrow, if allowed by the court. If not, the company will make other arrangements for transport. » Customers who have already commenced travel and are due to complete travel after tomorrow should visit the company Web site or call the reservations center. » Customers with travel dates starting after tomorrow will be issued refunds upon request to the company's Web site or reservations call center. WAILUKU » Hawaii Superferry officials must halt operation at Kahului Harbor and assist passengers they brought to Maui back to Oahu under a temporary restraining order issued yesterday by Maui Circuit Judge Joseph Cardoza. Cardoza has scheduled a court hearing at 1:30 p.m. tomorrow to determine whether a preliminary injunction should be issued ordering Superferry officials to cease operation until they have completed an environmental assessment for Kahului Harbor. Maui Circuit Judge Joseph Cardoza plans a hearing at 1:30 p.m. tomorrow to determine whether a preliminary injunction should be issued ordering Hawaii Superferry officials to cease operation at Kahului until they have completed an environmental assessment. Based on his reading of state law, Cardoza said in his order, the environmental assessment was required prior to the operation of the Superferry at Kahului Harbor. Cardoza said the temporary restraining order was necessary without taking input from Hawaii Superferry or state transportation officials to avoid "immediate and irreparable injury" by "risking actual harm to the environment." 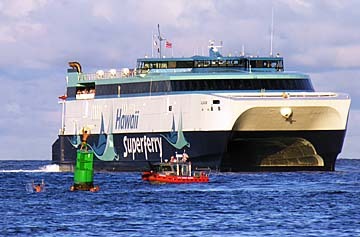 He also ordered Superferry officials to assist in providing transportation to their customers on Maui to return to Oahu. Hawaii Superferry President and Chief Executive Officer John Garibaldi said he was disappointed with the order, but would not comment any further. He remained positive about the outcome of the hearing tomorrow. "We expect to resume operations on the 30th," he said. "Should that not happen, we'll be contacting those people to reaccommodate them." The request for the temporary restraining order on behalf of the Sierra Club, Kahului Harbor Coalition and Maui Tomorrow follows a state Supreme Court decision last week that reversed Cardoza's decision in 2005 not to require an environmental assessment. Maui Tomorrow spokesman Ron Sturtz said he was pleased with Cardoza's action. "I think justice is being served and that the citizens of Maui are finally seeing justice being done and the environment being protected," Sturtz said. "This should have happened 2 1/2 years ago. ... It's frustrating they ignored the law when they were notified from day one." Cardoza's order does not apply to the Superferry's route from Oahu to Kauai and back. Garibaldi said the company will make every effort to get stranded customers and their pets back to their point of origin -- by air, if necessary. He estimated roughly 200 to 250 passengers and 100 or fewer vehicles remain on Maui. The company will not operate the ferry to and from Maui today or tomorrow, Garibaldi said. If the order is lifted, the company will transport the vehicles back to Oahu. If not, Hawaii Superferry will make necessary accommodations. Garibaldi called the environmental suit on Maui "unfortunate," and said yesterday the past couple of days saw 4,000 passenger-crossings. He said the "tremendous excitement and support" he has seen reflects what people want, namely an interisland ferry and an alternate mode of transportation. Sturtz said he believes that the state Public Utilities Commission permit for the Superferry is void because one of the assumptions for its issuance is that the business is in compliance with environmental laws. Commission Chief Counsel Stacey Djou said the commission is not planning to halt the Superferry from operating on Kauai. Djou said the commission is deferring to the courts whether an environmental assessment is required for operating on Kauai. Yesterday, the first weekday of Superferry operations, traffic moved briskly at the exit and entrance of the Hawaii Superferry on Maui. A major reason for the lack of congestion appeared to be because police were not allowing more than two vehicles per minute to exit onto public roads, under an amended court order issued yesterday morning by Maui Circuit Judge Joel August. More than 15 minutes after landing, vehicles on the Hawaii Superferry were back to back, rolling down the dock ramp, then snaking along the pier for more than a quarter-mile toward the exit at North Puunene Avenue. Maui Tomorrow Executive Director Irene Bowie said the presence of the police helped to control the traffic. Superferry customers reacted with uncertainty and disappointment yesterday with news that the interisland service had run into roadblocks. Dorian and Julio Vicente and their two children, 11 and 15, from Parsippany, N.J., were on Maui and scheduled to return this morning and had no clue about the injunction last night. "Oh, my God," Dorian Vicente said. "We have a flight to New Jersey on the 30th." When she learned that the company would provide a return flight for passengers, she said, "But where do we go and what do we do now?" The Vicentes planned to call the company last night. State Senate leaders criticized the state Department of Transportation for its handling of the Hawaii Superferry's operations and laid blame for the court battle squarely on the Lingle administration. "It's just unfortunate, the way it's played out, because I think there is considerable support for the Superferry," said Sen. Rosalyn Baker (D, Honokohau-Makena). "The people that we really need to be holding into account is the Department of Transportation." Senate Majority Leader Gary Hooser (D, Kauai-Niihau) added, "I'm very disappointed in the Department of Transportation in not acknowledging that they made a huge mistake." There was no immediate comment from Republican Gov. Linda Lingle yesterday. Her office referred calls to the Department of Transportation, which issued a two-sentence written statement by Director Barry Fukunaga. "The court has ruled on a temporary restraining order regarding Superferry operations to Kahului Harbor, and we are abiding by that decision and awaiting the outcome of Wednesday's hearing," the statement said. "We will also be proceeding with the environmental assessment process as instructed by the state Supreme Court." Senate leaders said the situation could have been avoided, noting that the chamber passed a bill allowing the ferry to operate while an environmental assessment was performed. "We offered them a compromise which would not have impeded their business," Hooser said. "The DOT rejected it, the Superferry rejected it and consequently the House did, too." Backed by House leadership, Transportation Chairman Joe Souki, a supporter of the ferry, did not hold a hearing on the bill when it came over from the Senate, essentially killing it for the session. "The judge has made a decision, and we need to abide by the decision of the court," Souki (D, Waihee-Wailuku) said yesterday. "What else is there to say?"